When Heavyweights Dereck Chisora and Tyson Fury met in July of 2011 for the British and Commonwealth Heavyweight championships both were unbeaten as professionals, yet also untested on the world level of the sport. In what was an entertaining fight it was Fury who outworked Chisora who faded down the stretch in route to a twelve round unanimous decision. An argument could be made that the fight between the two British Heavyweights established both as players in the division. In the near three years since that encounter both fighters have gone on to establish themselves as top contenders. Dereck Chisora went on to challenge Vitali Klitschko for the WBC world championship and frankly gave the champion a much more difficult fight than some had expected in defeat. Chisora would then go on to suffer a knockout loss at the hands of two division world champion David Haye in July of 2012. Following three straight losses including a controversial decision loss to undefeated contender Robert Helenius, a fight that many, this observer included, felt he had won prior to his title shot against Klitschko, one could well have had the opinion that there was some doubt as to Chisora’s future as a top contender in the Heavyweight division. It is after all not an easy task to bounce back following a string of losses. One thing that Chisora did do in his losses to Helenius, Klitschko, and Haye was earn the respect of Boxing fans for the “Game” effort he put forth in each of those fights. Questions however, regarding whether Chisora could bounce back from those defeats were warranted. Chisora began his comeback in April of last year scoring a ninth round knockout of journeyman contender Hector Avila. This would set the stage for a fight that would end in somewhat controversial fashion when Chisora stopped top contender Malik Scott three months later as Scott was counted out while on one knee on the canvas in the sixth round and seemed to get up right as Referee Phil Edwards had concluded his count. Although the bout ended controversially it was a competitive fight all the way through and put Chisora right back in the mix. Chisora would go on to score two more victories to close out 2013 including winning the vacant European Heavyweight championship against Edmund Gerber and moving up into the top ten in both the WBC and IBF Heavyweight ratings. Tyson Fury meanwhile one might argue has not been given the opportunity to show what he can do against the best that the division has to offer since he defeated Chisora nearly three years ago. Despite remaining undefeated since his fight with Chisora, Fury has found it difficult to secure marquee fights. Fury however, was tested in his last fight against former IBF Cruiserweight world champion Steve Cunningham in April of last year. The 6’3 Cunningham dropped the 6’9 Fury for the first time in his career in the second round before ultimately falling to Fury in the seventh round. Since the Cunningham fight Fury has been inactive due to a potential clash with David Haye falling through not once, but twice. For both Chisora and Fury 2014 could represent the year that both could find themselves in position to challenge for the World Heavyweight Championship. Ironically it would appear that the path to a title shot for both could lead to each other once again. When these two fought in 2011, both were seeking a position in the world rankings and each were looking to establish themselves as legitimate contenders. A rematch between the two could well lead to one either getting his second opportunity at a world title or the other getting his first. Before a potential rematch can be discussed however, both Chisora and Fury will co-headline a card this weekend at the Copper Box Arena in London, England. Chisora will face fellow former world title challenger Kevin Johnson in a fight scheduled for twelve rounds with Chisora’s WBA and WBO International Heavyweight titles at stake. Although the international titles that will be on the line in this fight might not seem to be of much value to some, what is really at stake here is higher positioning in the Heavyweight ratings and such titles can be used as a catalyst to elevate a fighter toward a potential world title shot. The 6’1 Chisora will face a fighter in Johnson who can box and has good lateral movement. One might argue however, that this fight could represent Johnson’s last chance to reemerge as a contender in the Heavyweight division. Johnson comes into this fight having lost three of his last six fights including a lopsided decision loss to Tyson Fury in December of 2012. Johnson does however, have Boxing skills and will no doubt be looking to make full use of his eighty-two inch reach to keep Chisora on the outside. One could expect that Chisora’s fight plan as it has been in previous fights will be to simply attempt to walk his opponent down applying pressure and looking to get on the inside where he can be effective. It is unlikely with an eight inch disadvantage in reach working against him that Chisora could win this fight on the outside. Johnson has also never been stopped in thirty-four professional fights and it will be interesting to see should Chisora be able to get inside Johnson’s reach if he can do what four previous opponents who have scored victories, including Vitali Klitschko could not do and stop Kevin Johnson. In the co-main event Tyson Fury will take on late replacement and one time contender Joey Abell in a fight scheduled for ten rounds. Out of these two fights, there could be an opinion of some fans and experts alike that this is a mismatch and that Joey Abell is a considerable underdog heading into this fight. This opinion would likely be based on Abell’s having suffered three knockout losses in his last five fights including losses to top contenders Chris Arreola and Kubrat Purlev. Even though this fight would appear to have all the signs of a fighter being brought in as an opponent for a top contender in a would be “Tune-up” for Fury with a potential big money rematch looming down the road, there could be a reason for caution. Last Friday Fury suffered a cut over his left eye while sparring with former world title challenger Eddie Chambers. Under circumstances when a fighter suffers a cut in training, one would be likely to assume that the fight would at minimum be postponed in order to allow that fighter’s cut adequate time to heal. Fury however, has insisted that he will go through with the fight as scheduled and as of this writing there is no indication that the fight will not take place. In some ways the cut suffered by Fury going into this fight has reminded me of circumstances Julio Cesar Chavez Sr. found himself in prior to his first fight with Oscar De La Hoya in June of 1996. Chavez suffered a cut over his left eye just days before the fight with De La Hoya, which subsequently led to his downfall. The cut reopened leaving Chavez a bloody mess before the fight was stopped in the fourth round, subsequently costing Chavez his Jr. Welterweight world title. It goes without saying that there is always a danger for a fighter to get cut in any fight. Although I can certainly understand Tyson Fury’s eagerness to get back in the ring after spending nearly a year on the sidelines, it is a risk that could prove to be costly. Although Joey Abell is considered by some to be a stepping stone for Fury in this fight, he could quite frankly end up benefiting from questionable judgment by Fury to go ahead with the fight. Whether or not the cut will become a factor in this fight remains to be seen. As was the case when Dereck Chisora and Tyson Fury met nearly three years ago, this card has generated attention outside the United Kingdom and will be televised in Canada on the Fight Network. 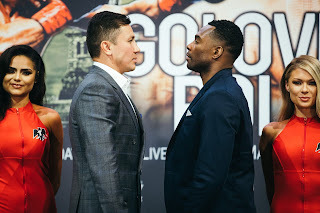 It can also be viewed via pay-per-view throughout the United States through both cable and satellite providers as well as being offered on a pay-per-view basis across the Internet worldwide on Go Fight Live Network (WWW.GFL.TV). As the Heavyweight division could be heading toward a period of transition of sorts, the Boxing world continues to look for the next dominant Heavyweight force who might take over the division in the post-Klitschko era. With the recent retirement of Vitali Klitschko, there is, but only one Klitschko left standing atop the Heavyweight division… Wladimir Klitschko the IBF/WBO/WBA/IBO unified world champion. At nearly thirty-eight years old however, one does have to wonder how much longer Wladimir intends to keep fighting. It is certainly possible that whomever should emerge victorious this weekend and whomever could emerge out of a potential Chisora-Fury rematch could be likely opponents for Klitschko down the line. How much further down the line is a subject for debate. This card however, should serve as another reminder that Boxing is truly a global sport and that there is a demand from fight fans worldwide to have access to the best of what the sport has to offer no matter where it is taking place. No matter what should transpire this weekend, it is my hope that the trend of the sport of Boxing being presented on a global scale to all who seek it, is a trend that continues.